At a minimum we should demand good observational support for any specific claim. 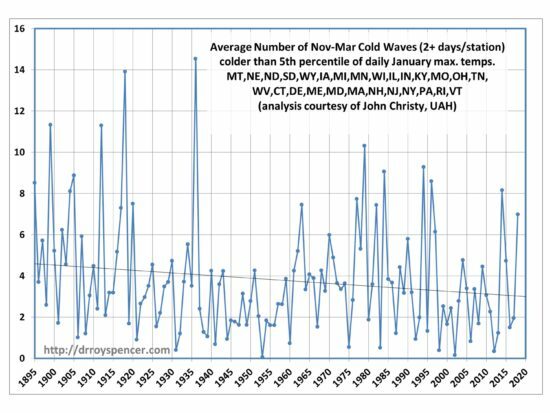 In this case I would say that the connection between Eastern U.S. cold waves and Arctic sea ice is speculative, at best. I don't know about US but in my state (Karnataka), I have noticed lot of changes in last 40 years. The city where I have been living since last 35 years (Bangalore) has become hotter and winter has disappeared. I used to use sweaters in winters till 1998 and well into March, weather used to be pleasant. But now, starting 2nd week of February, we have hot air blowing and we need air coolers and AC. I used to shiver if someone turned on a fan in late 80s. I have also lived in other parts of Karnataka and have visited many other places around. The cool,crisp, fresh air of Agumbe has disappeared. It becomes unpleasant even in January. Madikeri used to be foggy and chilly most of the year and now it's hot and humid in summer and winters are short. The rains have become bursty and many places that used to get a steady drizzle in monsoons now get heavier rains of short duration.